Racism That's Too Ugly to Publish? ...we've received several letters scolding us, in essence, for not sanitizing the news. While we're not thrilled for being taken to task, it's clear that people's hearts are in the right place. Good people are offended by bigotry. Reporting the story required some sort of description of the offensive meme. A picture is worth a thousand words. Why not let readers see for themselves the unvarnished ugliness at the heart of the controversy? Our feeling is that it's a disservice to omit something so vile and disgusting because it robs readers of a complete picture of what's going on in their community. Should the goal of writing about such a controversy be to soften the outrage due? If you're outraged, you should be. But anger should be directed at the person who created the meme -- not The Sentinel for pointing out that it appeared in the very public Facebook sphere for all the world to see. Of course the newspaper should include the meme itself in its news story for you to see. 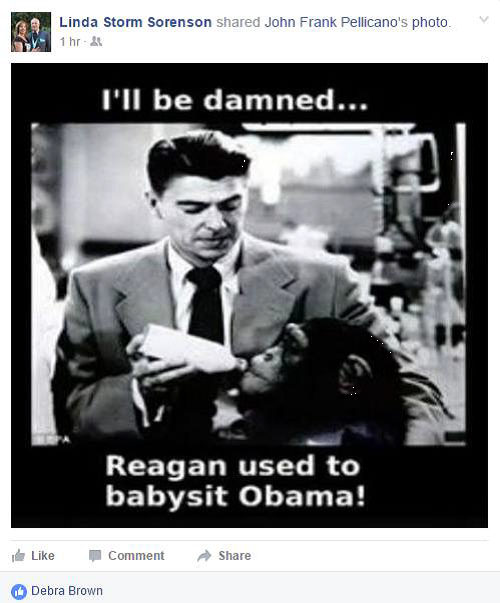 It would be one thing if the racism was posted by a nobody, but it came from Sorenson, who's elected to her post by the Republicans in Delta County, Colorado. Therefore, she represents them. So she has enough of a "public" status to merit being held accountable by the Grand Junction Sentinel. And part of the process of public accountability, for the newspaper, is letting us know, within the broadest bounds of decency, what, exactly, she's up to.